Update: Unfortunately the Watervliet Arsenal Museum in Watervliet, NY has closed for good. The former Museum Specialist from this museum wrote to tell me that the government decided to defund the museum in May of 2014 and the museum will not be reopening. This is sad news as it was a very unique museum and the only one I've visited that concentrates on artillery and their ordinance and inner workings. I am sorry to see them close. Consider these pages as a snapshot of how the museum used to appear before its 2014 closure. The Watervliet Arsenal Museum is about 6 miles north of downtown Albany in Watervliet, NY. The museum is located within the grounds of an active US Army base. You will need to provide a current US driver's licence to the guards in the guard house to get a temporary pass that will allow you to enter the base and visit the museum. 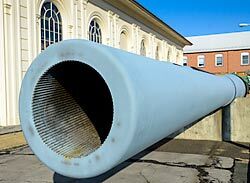 The arsenal itself has been designing, testing, and producing mortars, cannons, other munitions, and naval propeller shafts since 1813. This museum may be small but it contains some very interesting exhibits. Outside the 16, 14, and 8 inch Battleship gun barrels dwarf the Sheridan tank and Paladin self propelled howitzer which are also next to the building. 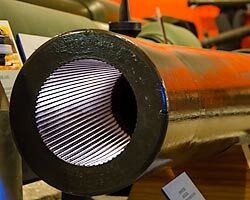 To see the size of these big gun barrels up close is truly amazing. Immediately inside is an array of early cannon, from Revolutionary War muzzle loaders to early and later breech loading cannon. 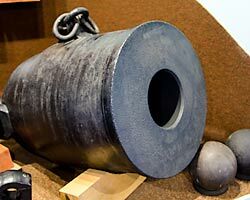 A very rare Civil War Confederate Williams Automatic Cannon is on display. At the time it was a big secret and a step above what the Union forces had, although it did not enter mass production. Several other automatic guns are on hand, from a Civil War hand cranked Gatling Gun to a modern 6 barrel 20mm Vulcan electrically driven Gatling Gun used in the F-15 and AC-130 Spectre gunship. One item that I had never seen before is the cutting bit used to cut the rifling grooves in the big 16 inch naval guns. 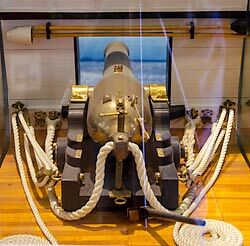 It is 16 inches in diameter, several feet long, and has adjustable cutting bits all around its outer circumference for cutting rifling grooves while being forced and turned through the battleship gun barrel by a big hydraulic ram. If you know of any video of that machining process online, let me know and I'll post the link here. Beyond that are several glass cases with small arms including developmental prototypes of the M-14 rifle from conception to final production version. Also on display were several variants of the M1 Garand Semiautomatic Rifle, including the M1D Sniper version of the Garand. Several axis weapons are on hand including a German MG-34 machine gun, 9mm Parabellum Luger pistol, and WWII Japanese Knee Mortar. A number of howitzer cannon barrels and tank gun barrels are laid out near the theater area, including the M256 120mm Smooth Bore gun used in the M1 Abrams Main Battle Tank. This display gives you a good view of the different muzzle brakes and breeches. The 152mm Gun Launcher breech is particularly interesting. This is the same type of breech used on the M551 Sheridan tank that fires both guided missiles and spin stabilized conventional rounds. The barrel is rifled to accommodate the conventional tank shells. But it has an interesting feature to allow it to fire guided missiles without imparting a spin on them that would make it impossible to guide properly. 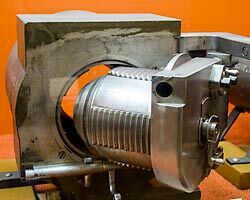 Along the length of the bore is a slot cut chamber to muzzle. A key on the missile seats in this slot, and rides it while the missile transits the length of the gun barrel, preventing the round from spinning. I never understood how they could fire a guided missile through a rifled gun barrel until I saw that display. 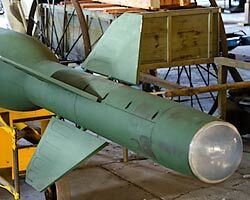 The GBU-28 is one of the most impressive pieces. 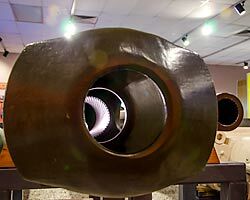 Made from an 8 inch cannon barrel and packed with explosives, the Bunker Buster Bomb is over 25 feet long. This is the same type of bomb that was used to destroy hardened concrete bunkers during Operation Desert Storm. If you have ever wanted to see a tactical nuclear weapon, the museum has several inert shell casings on display. They range from several 8 inch nuclear artillery shells to the rocket assisted nuclear tipped mortar shells fired from the Davey Crockett Recoilless Atomic Gun. The museum also has on display a number of scale models. 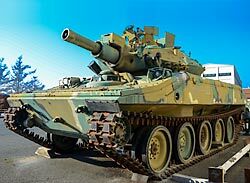 In one case are a number of kit built tanks and self propelled guns that are finished to a very high standard. In other glass cases are several early cannon. They are all scratch built and are an absolute wonder to behold. My photos don't begin to do justice to the care and skill of the modelers who created them. The Watervliet Arsenal Museum restoration staff has done a great job of restoring and displaying their exhibits. Keeping all those bare metal gun barrels and breeches clean and rust free is no small task, and moving and positioning exhibits weighing thousands of pounds is a real challenge. When they reopen to the public in 2015, make it a point to pay them a visit. 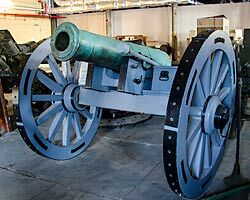 The museum staff are good guys and proud of their collection and are glad to host visitors interested in the history and armaments produced by the Watervliet Arsenal over the years. 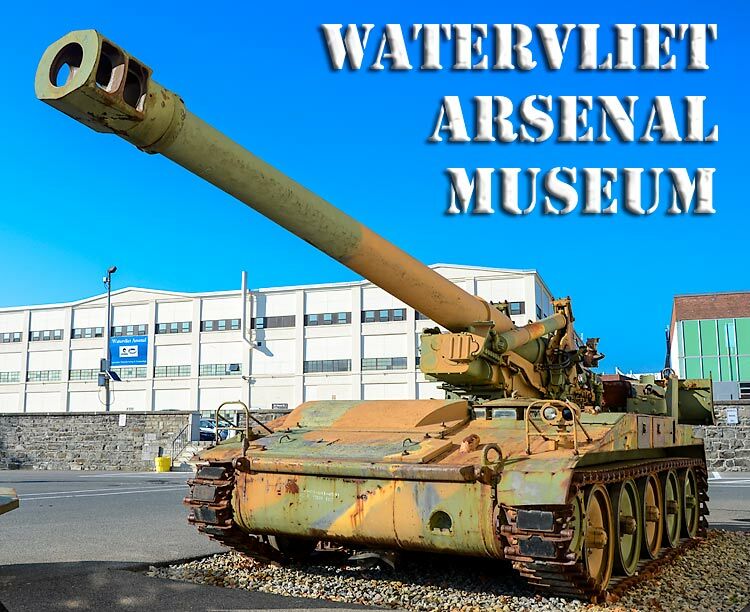 Visit the Watervliet Arsenal Museum Website for more information, reopening date, hours, and directions. This website is not affiliated with the Watervliet Arsenal Museum or the Department of Defense.